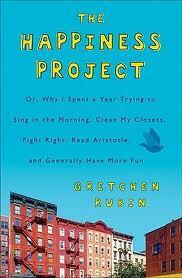 It took me a good while to read The Happiness Project by Gretchen Rubin, but I am glad I did. There was so much to digest, that I wanted to take my time with this selection. One thing I must say I greatly enjoyed was the fact that the author, “being Gretchen”, included a vast array of interesting quotes and research statistics in the book. This I admire! I like it when an author goes the extra mile. I’ve post-it notes on many of the pages marking thought-provoking quotes to add to my journal. There were many things in this book that made me think about my life and the ebb and flow of personal happiness and satisfaction with my circumstances. As I read the book, I reflected on what I call my Five Finger Philosophy of Life. Much like the author, I developed my list of “splendid truths” some years ago while recuperating from a serious illness. Lying in bed with staples up your midsection and three fractured ribs gives you plenty of time to think about what really matters. It was then I decided to focus on and incorporate five things that made daily life worth living to me. They are: Praying, Singing, Laughter, Seeing Something of Beauty in Each Day, and Telling Someone I Love Them. I’ve reflect on these often and find that I am a happier person if at the end of the day I can say these five elements were practiced. I was surprised by the many things I have in common with Rubin! St. Therese of Lisieux is my patron saint, I am a writer, I feel at home in the library, and I love children’s literature. Her idea of a children’s literature group was inspiring! Not long ago, I had a friend who was very unhappy and I remember suggesting to him that he choose “happiness”. He didn’t agree that happiness is something we have the ability to choose. As far as I’m concerned, it may not be easy, but it can be done. I know, I do it every day. Like Rubin, I may not always succeed, but my days are so much happier when I do. This entry was posted in Uncategorized and tagged Happiness Project, Rubin. Bookmark the permalink.